Well, the French are not so different than us – they like their sweet treats for breakfast, mostly in the form of chocolate – hot chocolate, chocolate brioche, chocolate spread on baguettes, chocolate crêpes. 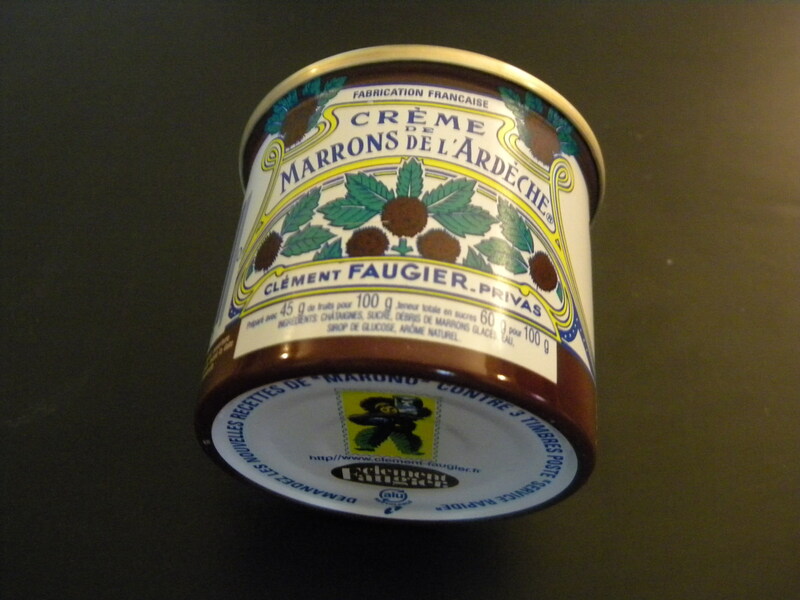 Chestnut Spread, or Crème de Marrons de L’Ardèche – Ardèche being a region in the South-east corner of France just above Provençe that includes Lyon and the Rhône Valley – is similarly used on bread and in flour-based recipes such as cakes. This is all about texture – the powdery presence of the ground chestnuts together with the grainy sugar. The flavor leads with sweet and ends with chestnut. Not surprisingly, the ingredients are simple – chestnuts, candied chestnuts, simple syrup and sometimes vanilla. I get it for $2.50 at my local bakery, La Boulengerie, in Forest Hills, which is unabashedly, 100% focused on great, traditional French bread and pastries, and so offers the kinds of spreads that are best showcased on – and, in turn, showcase – the essence of high-quality bread. 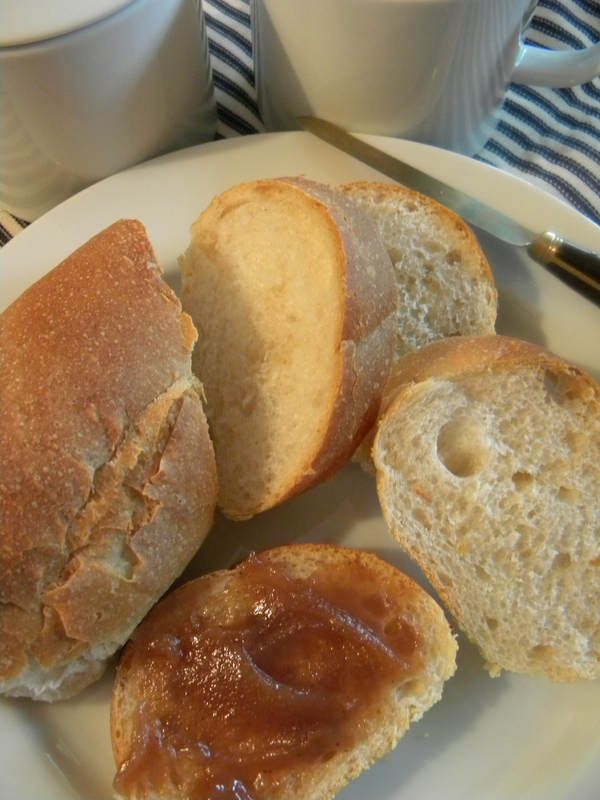 A great resource for finding recipes for Chestnut Spread can be found at Easy French Food. Sometimes I find the most delightful products in the most unlikely places. At my local Key Foods, home of questionable produce and barely acceptable dairy, I occasionally run into exceptional candies. From the Italian outfit Ferrero, a company whose impressive portforlio of goodies includes Nutella, Tic Tacs, Ferrero Rocher, and the Kinder line – think Kinder Happy Hippo – I bought for $3.09 the sleek and pretty Yogurettes. They’re long and skinny like a cigarette – see what they did? 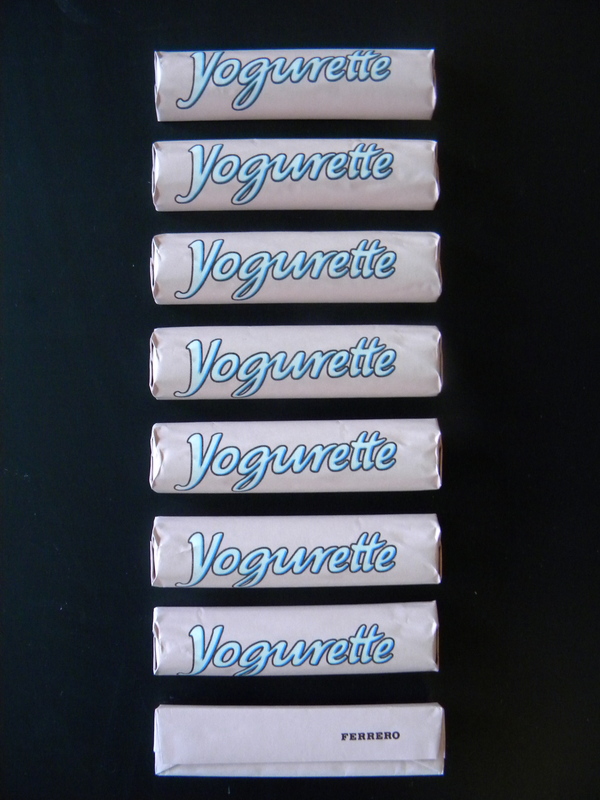 Yogurettes are fantastically rich. The scent alone is transporting. Opening the pink foil you see the chocolate is fashioned with a wavy, liquidy motif, harkening milk. 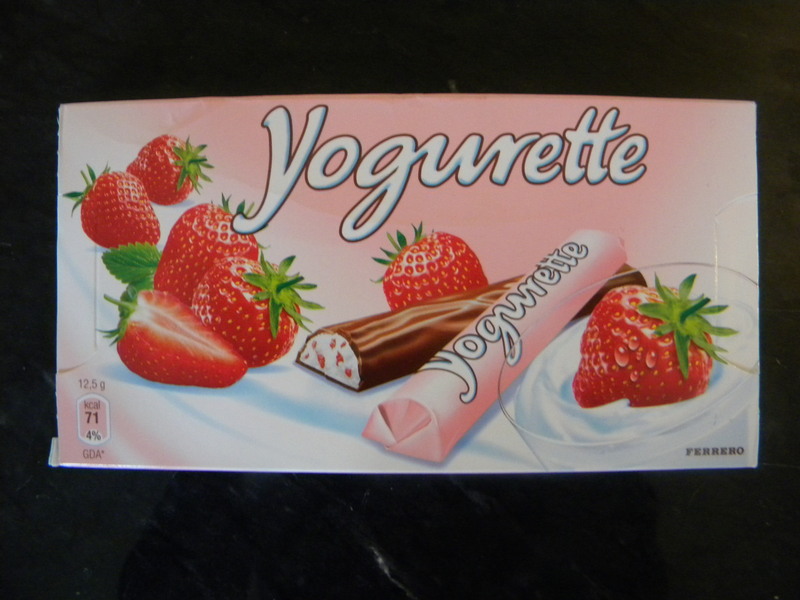 Indeed, the essence of the milk chocolate runs neck-and-neck with the strawberry yogurt flavor, which absolutely tastes like strawberry yogurt. These were fresh and soft and satisfying – one stick is frankly enough for a sitting. Oh, the Italians and their belief that all things can be sensual – be they gourmet dishes or basic dime store treats. Why aren’t American condiments packaged so beautifully? 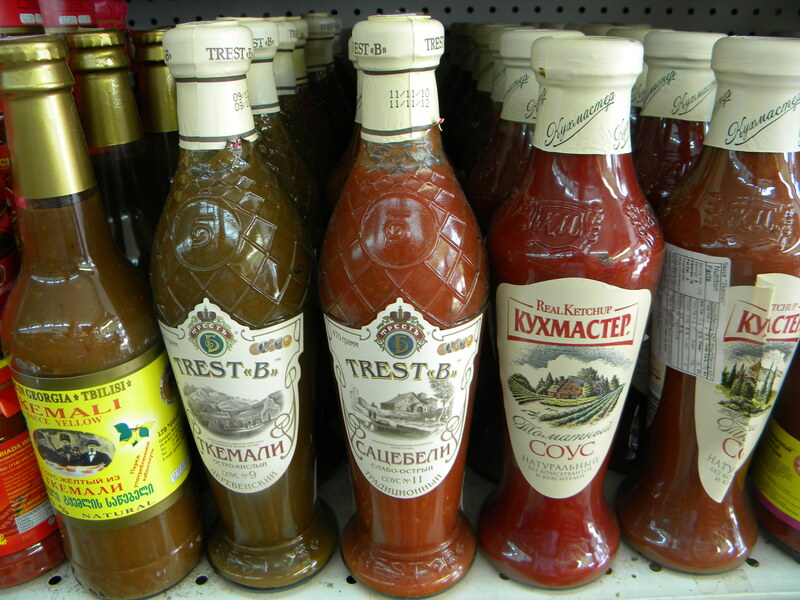 In the shopping district of 108th Street at 63rd Road in Forest Hills, NY, home of a thriving community of Bukharan Jews, I picked up a few bottles of the TREST-B tkemali sauce, a classic, Russian / Georgian topper made with a base of tart plums. The green variety I purchased (second from the left in above image) is mostly acidic with a hint of sweetness, as is tomato-based ketchup. It’s blended with coriander, cayenne pepper, garlic, fennel and sometimes mint, and adds a really flavorful zing to lean proteins – especially seafood. I spotted this at a beautiful European-style deli, Berezka #1, for just under $7. (718) 897-5577. I have found one source for buying Trest-B online, delitoyoudirect.com, based in California and Australia, specializing in mostly Russian and Ukranian goods. $8.29 per bottle.